When an author sets ink to paper, they can have little idea of the effects their words will have, into whose minds they will plant seeds, and what actions those seeds will spawn. But today is World Book Day, when we remember that books change the world. 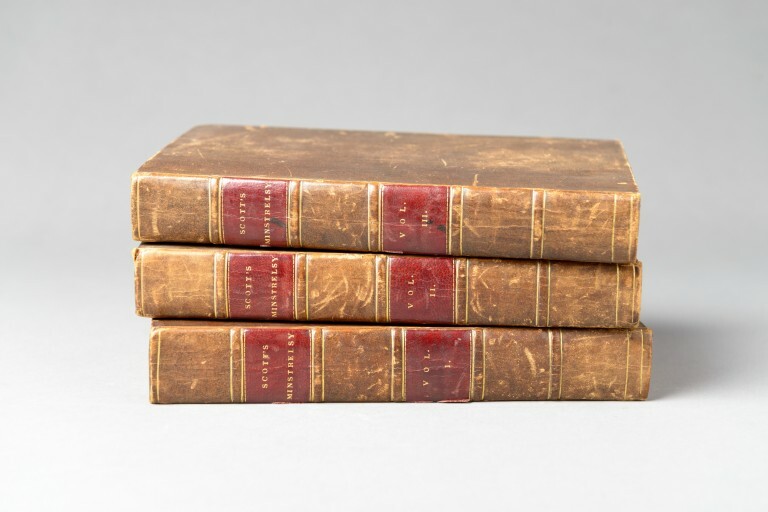 The books of Sir Walter Scott have helped to shape the world we live in today. Many people have found themselves caught up in the adventures of Ivanhoe, the plight of Rebecca and the romances and battles of young Edward Waverley. Scott gave Jarlshof its name and got the king into a kilt, but I’m most grateful for his legacy in bricks and mortar. Many of our sites and their stories survive because of the writings of this one man. 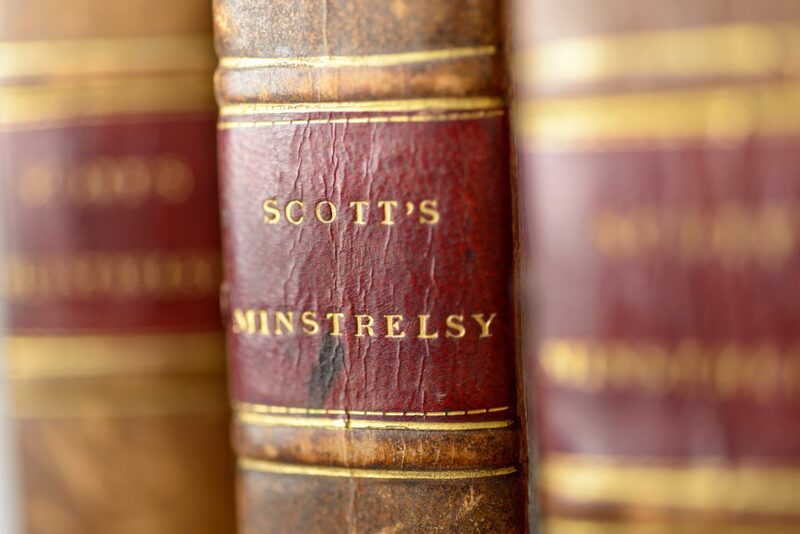 Scott’s first publication under his own name was The Minstrelsy of the Scottish Border in 1802–03. In its introduction, Scott wrote compellingly of turbulent Border history; of the powerful chieftains who supported John Balliol over Robert the Bruce, and lost their castles and their lands; of the ‘exorbitant power’ of the Douglases who followed them, and how ‘the sun of the Douglas set in blood’. This collection of Border Ballads captured the imagination of the public – the first edition sold out within six months, and translations into German, Danish and Swedish followed soon after. Its publication in North America made Scott famous. Scott’s Minstrelsy of the Scottish Border – his first major publication, and the one which won him fame on both sides of the Atlantic. In the decades that followed, Scott wrote poetry, novels and antiquarian works about the Border region. 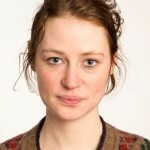 His own passion inspired others, and conservation projects on historic buildings followed one after the other. 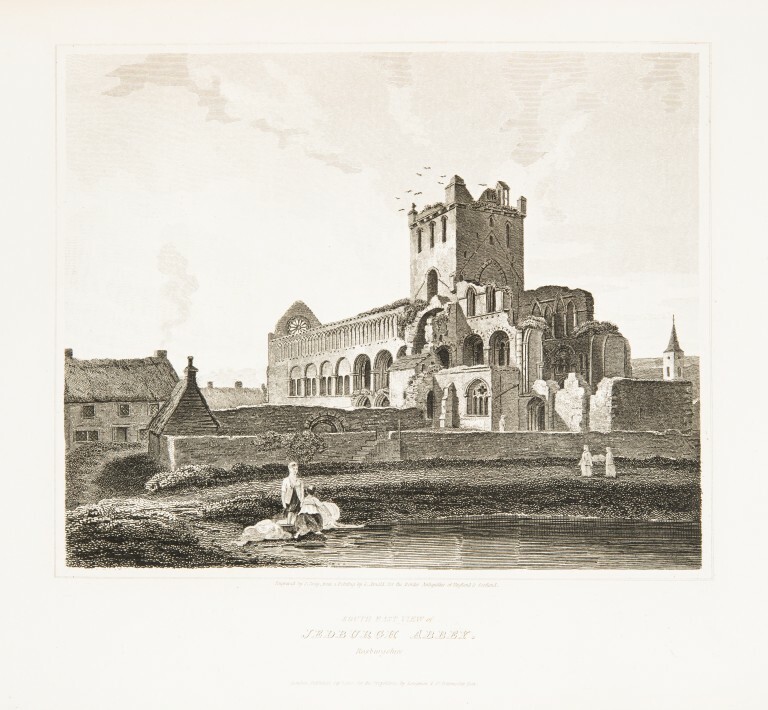 Melrose and Jedburgh abbeys were both restored in the 1800s, as was Hermitage Castle, the setting for the Minstrelsy’s tales of Lord Soulis and the Cout of Keeldar – a wicked wizard and a giant knight with impenetrable armour. 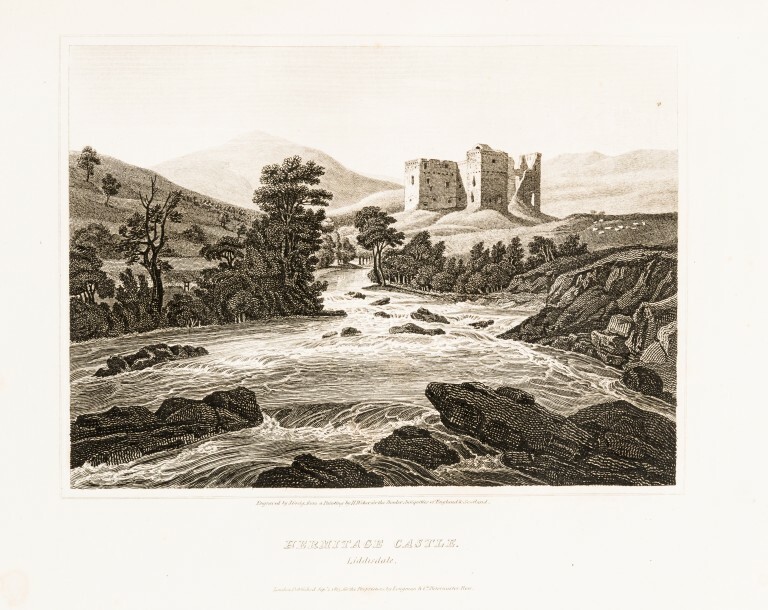 Hermitage Castle, shown in Scott’s Antiquities of the Scottish Border. This illustration depicts the castle before restoration work was undertaken by Scott’s relative, the Duke of Buccleuch, in the 1830s. Scott was particularly involved in the restoration work at Melrose. During the abbey’s restoration, he wrote most revealingly in his letters to Lord Montague. I am quite delighted with commencement of the Melrose repairs, and hope to report progress before I leave the country, though that must be on Monday next. Please God, I will be up on the roof of the old Abbey myself when the scaffolding is up. Scott’s love for the ancient abbey can be seen in each excited word of his letters, and it is largely to his passion that we owe its survival. 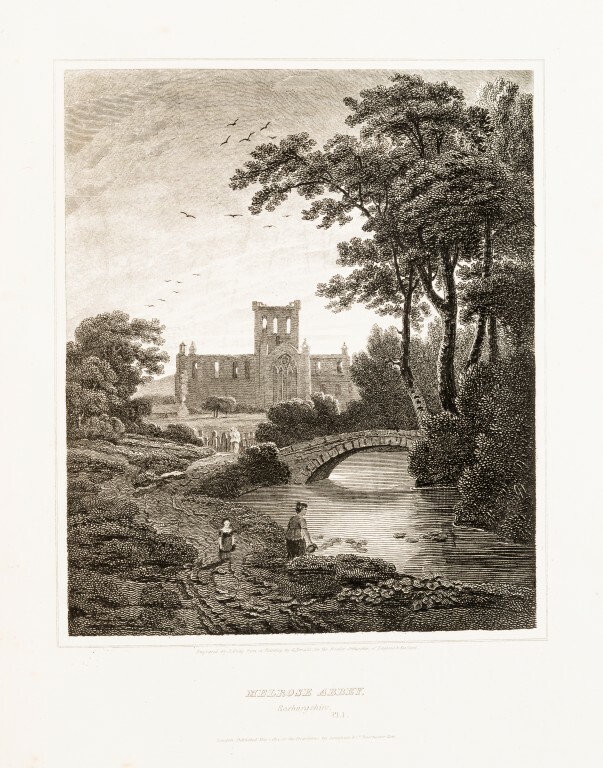 The serene ruins of Melrose Abbey, shown in Scott’s Antiquities of the Scottish Border. So the next time we walk among the ruins of the great monastery of Melrose or the foreboding towers of Hermitage, let us remember the man who saved them, and his books. They made our world that little bit more beautiful.